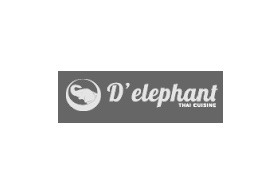 D’Elephant Thai Cuisine is a casual dining restaurant set to offer affordable & authentic Thai food throughout Australia. Launched in late 2014, the founders who are very passionate about authentic Thai food have noticed a gap in the market when they themselves could not get true Thai food that doesn’t cost a fortune for their whole family. With experience in similar ventures, they decided to bring the elephant, aptly named D’Elephant to Australia. D’Elephant Chadstone provides a modern Thai ambience that is casual & comfortable for the whole family to enjoy a delicious & healthy meal. Nothing screams more authentic than the dishes featuring true Thai ingredients, cooked to order by Thai chefs & served by Thai waiting staff. D’Elephant team prides in being truly Thai people, who can create the latest Thai dining experience & educate consumers of the modern Thai culture.